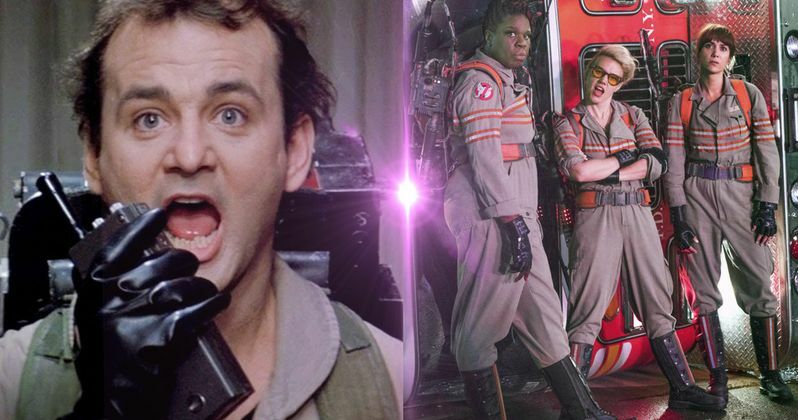 What Does Bill Murray Think of the New Ghostbusters? This summer's most divisive movie is easily the new Ghostbusters reboot which has come under a lot of fire over the past few months. Fans have been mad about any number of things, from the all-female cast to the fact that Sony had the gall to remake this 30 year old 'classic' in the first place. In the past week, co-creator and original star of the movie Dan Aykroyd has shared his thoughts on the redo, calling it 'breathtaking' and making the claim that he'd spend his 'own money' to see it. Now, the rest of the original cast is making their feelings known. And if we're to believe them, it's not as bad as the loudest haters would have us believe. As it stands, the first trailer for director Paul Feig's Ghostbusters has the distinction of being the all-time most hated trailer on Youtube. That is no small feat. Subsequent trailers have been just as criticized. Most claim it has nothing to do with the cast, calling the latest footage uninspired and unfunny. But appearing on Jimmy Kimmel last night, the original Ghostbusters had to disagree. And the opinion most want to hear at this point is that of Bill Murray. So, what does the leader of this supernatural squad have to say about Kristen Wiig and Melissa McCarthy's antics? He doesn't exactly give it a glowing review, but it seems honest. "When you see the film, and you'll delight in the film, it sort of rumbles along in the beginning. You're going, 'Oh God, are they going to pull this thing off?' I felt like a stepfather to the whole thing. There is no quit in these girls. This is a tough movie to pull off, because it's a big concept. There's a lot on the plate - there's a lot of expectation." So, it starts slow and ends big! That might not be what people want to hear, but it's the truth as told by Murray. Bill has always been blamed for there not being a true Ghostbusters 3, though he did turn up to voice a video game that most view as the true third sequel. The comedy icon didn't want to do another live-action movie, and is rumored to have sent a shredded copy of the script back to the studio at one point. It even took him a lot of convincing just to come on and do a cameo in this new version. He explains. "I thought about it for a very long time. Like, many, many months. No, that's not right. I was seriously thinking about this for years, really ... It kept eating at me, and I really respect those girls. And then I started to feel like if I didn't do this movie, maybe somebody would write a bad review or something, thinking there was some sort of disapproval [on my part]." So Bill Murray is doing his part to ensure that this new Ghostbusters gets off the ground properly. The man was joined by the new cast last night, and you can see some of the interview in the video below. True to form, Bill Murray didn't offer a glowing review as to appear as a studio shill. Just let the new Ghostbusters wash over you, and you might get something fun out of it seems to be his stance. You can check out the video here courtesy of Youtube. The movie is in theaters this July.